“A fresh new fantasy of an enchanting world.” – Wendy Orr,author of Nim’s Island and Dragonfly Song. My Review: The story starts off with a wedding, but unfortunately for Esme it is not a happy one. Esme lost her mother when she was only eight years old and has never been able to move on. Esme never truly believed her mother had disappeared at sea and spurred on by her father moving on, she decides the time has come to go off on her own and discover the truth. 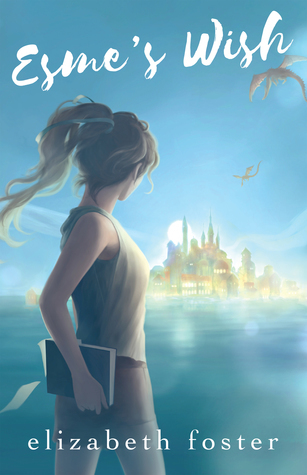 What she soon discovers is another world full of magic, myth and secrets. Back home Esme and her mother were always considered outsiders and as a child Esme struggled to find real friendship. On her journey Esme meets Daniel and Lillian, both offering friendship and whatever help they can. At first she finds it hard to believe that anyone would want to help her, let alone be her friend. She learns to trust in Daniel and Lillian as they join and help her on her journey. The writing followed well, was easy to read and the story was steadily paced for the most part, kicking up with a action packed fast paced last few chapters. I raced through the last few chapters desperate to know how the story ends – and if that isn’t a sign of a good story, then I don’t know what is. The bad ‘guy’ was deplorable and the good ‘guys’ easily likeable. The setting for the story, a mythological wonderland. There were Dragons – always a plus. And they rode them – even more of a plus! The ending gives us just enough resolution for it to be satisfying, but also leaves enough unanswered that it makes you really want to read the next book. This entry was posted in Book Reviews: ALL, Book Reviews: YA only and tagged #AusYABloggers, Aussie Author, book review, Enchantments, Esperance, fantasy, friendship, Love OZ YA, LoveOZYA, mystery, other worlds, YA Fantasy, Young Adult, Young Adult Fantasy by Sarah "SacaKat" Fairbairn. Bookmark the permalink. Reminiscent of Arkarnae -Transported to a new world, finding new friends to adventure with. The city and it’s history has a Greek mythology feel to it. Other than the main characters age, I think it could near be a MG, clean uncomplicated text, easy story to follow, etc etc.